Of Mumbai, it can be said that the only ‘constant’ about it is ‘change.’ Its dazzling growth from a small fishing village to India’s commercial capital is proof of its amazing adaptive and progressive character. 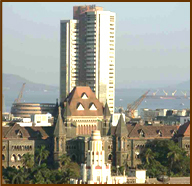 From the 17th century archipelago with a Fort built by the British East India Company, it increased in importance as a trading port, then as a seat of governance for the erstwhile Bombay Presidency and now the state of Maharashtra and the undisputed financial nerve-centre of the country. Each generation left an imprint on the city, its people, and consequently its architecture. Now Mumbai's skyline consists of a multitude of architecture styles - some images from the past, some contemporary, some timeless. Much of the its kaleidoscopic past has filtered into the present. If one takes a walk down any street in the heart of city and one can decipher the layers of history hidden behind the dusty facades and crowded signboards. Mumbai's architecture stands as a testimony to this change - a palimpsest used by each generation. BHW currently offers 3 walking tours in the Fort district. All the tours showcase South Mumbai's amazing collection of historic Colonial landmarks and architectural gems, built in a vast array of materials and styles. Each BHW tour begins with the encapsulated history of Mumbai's kaleidoscopic past. It then continues with the introduction of the walk route and specific area that will be covered. Each building of historic or architectural merit is then pointed out enroute, highlighting any special cultural or social anecdotes. Visual aids like maps, archival images and photographs of building interiors are an integral part of the tour. Architectural styles, construction materials and methods, planning elements, ornamental details as well as any conservation efforts or structural modifications are explained to the participants. Participants are encouraged to share their views along the way as well. Please re-check rates at the time of booking. » Rs. 3,750/- minimum charge for a group of upto 5 participants. » Rs. 500 /- extra for every additional child aged 6 to 12 years. 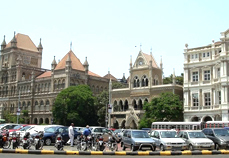 On this route, you will see a veritable parade of archetypal Neo-Gothic public buildings built in the 1860s & 70s such as the glorious Bombay University Library with its high campanile and the grand imposing High Court that are South Mumbai's main architectural attraction. Fronting this line of historic Gothic edifices across the open space of Oval Maidan is a row of superb 1930s Art Deco apartment buildings making this a marvellously unique setting both visually and architecturally. Another highlight on this heritage route is the culturally vibrant Kala Ghoda node. Gateway of India You will be met by your presenter/s at the statue of Swami Vivekanand which is on the left-hand side, when facing the Gateway monument. He/she can be identified by orange BHW Presenter ID badge round the neck. Introduction to Mumbai and surrounding Fort heritage precinct. Viewing of all heritage buildings around Apollo Bunder (still at the Gateway area) including the Gateway of India, Taj Mahal Hotel, Royal Bombay Yacht Club, Atomic Energy Commission Offices etc. Walk to via Chattrapati Shivaji Marg (former Apollo Pier Road) to Regal Circle. Stop to view the Art Deco Dhanraj Mahal. Cross the road at Regal Cinema and take a detour into Nathalal Parekh Marg (old Wodehouse Road), off Regal Circle. Visit the Cathedral of Holy Name. Walk back to Regal Circle. Cross the road to enter into the parking lot in the centre of the intersection. Stand near the Wellington Fountain and view the historic circle of buildings around including the State Police Headquarters, Regal Cinema, Majestic Hotel, Indian Mercantile Chambers, Institute of Science and Prince of Wales Museum (now known as C.S. Vastu Sanghralaya). Exit the Regal Circle, cross Madam Cama Road and view the National Gallery of Modern Art. Walk along M.G. Road pavement to Kala Ghoda, via the arcade of the Elphinstone College. Cross the road at Watson’s Hotel (Espanade Mansion). Re-group inside the Kala Ghoda parking lot. 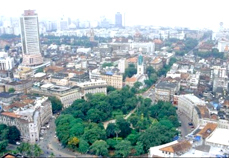 Here, participants will be given an explanation of significance of 'Kala Ghoda' with respect to the Fort and details of all buildings around this historic district including the Elphinstone College, David Sassoon Library, Army & Navy Building, Watson's Hotel, Keneseth Eliyahoo Synagogue. Walk to the Mumbai University and view from outside. Cross over to Oval Maidan to take in view of High Court, Art Deco line of buildings, Eros Cinema tower and Western Railway HQ building skyline. » Rs. 750/- extra for every additional adult. The city’s long association with the British is reflected in the old world charm of its buildings made in varying styles - from the early 1800s neo-Classic to the late 1860s Victorian neo-Gothic, early 20th century Indo-Saracenic style of architecture that combined Gothic-like flamboyance with Muslim-Indian architectural features, and also the flamboyant Art Deco of the 1930s and 40s. On this tour you see some of the city's well-known landmarks, in the heart of the old Fort area – Mumbai’s oldest business district. Besides their heritage value, the presence of over 30 banking establishments and important financial institutions renders the area into Mumbai’s principal tourist and commercial hub. Asiatic Library (also known as the ‘Central Library’) Shahid Bhagatsingh Marg, opp. Horniman Circle Gardens, near Old Customs House, Fort You will be met by your presenter at the bottom of the massive flight of steps, to the left-hand side when facing the building. He/She can be identified by a ‘BHW Presenter ID badge' round the neck. Then cross the Shahid Bhagatsingh Marg, to enter through the east gate of the elegantly laid out Horniman Circle Gardens. View the historic Gardens. Reach Mumbai Samachar Marg, the historic location of Asia's oldest Stock Exchange. Gather at Old Well near west gate of Horniman Circle Garden. View the BSE building and other leading banking institutions of the country (all externally only). Visit the UNESCO Heritage Award winning St. Thomas Cathedral, the city's oldest British church. Continue towards Flora Fountain along Veer Nariman Road. Stop at the highly embellished Fountain, a quintessential city icon and take in the splendid structures that define the perimeter of this intersection. Cross the road to the footpath outside Public Works Department Office (opp. Central Telegraph Office). Take a left on same footpath and walk along the magnificent Gothic-style High Court building with its fabulous Venetian style galleries (all externally). View the Mumbai University Campus (from outside only). 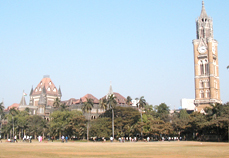 Cross to reach the Oval Maidan to take in a view of the High Court, Western Railway HQ building. Eros Cinema tower and Art Deco line of buildings. » Rs. 6,000/- minimum charge for a group of upto 5 participants. » Rs. 800 /- extra for every additional child aged 6 to 12 years. This walk is combination of the Kala Ghoda and Horniman Circle routes together as one extended tour. Asiatic Library (also known as the ‘Central Library’) Shahid Bhagatsingh Marg, opp. Horniman Circle Gardens, near Old Customs House, Fort You will be met by your presenter at the bottom of the massive flight of steps, to the left-hand side when facing the building. He/She can be identified by a ‘BHW Presenter ID badge' round the neck. (This walk can also commence at the Gateway of India, as per the participants’ convenience. Please specify at the time of booking). View the Mumbai University Campus – from outside only. Walk to Kala Ghoda intersection and view buildings around this historic district. Visit to K. E. Synagogue will be possible only if permission is granted – can only be ascertained only on the spot. Walk to Regal Circle. Stand near the Wellington Fountain and view the historic circle of buildings around. Take a detour into Nathalal Parekh Marg, to visit the Cathedral of Holy Name. Walk to the Gateway of India, view surrounding Apollo Bunder precinct including Taj Mahal Hotel, Royal Bombay Yacht Club etc. Visit to the Holy Name Cathedral and St. Thomas’ Cathedral will be possible if mass timings do not clash. Visit to the Keneseth Eliyahoo Synagogue is restricted due to security concerns. Proof of identity must be produced to enter. Entry permitted only from Monday to Thursday provided mass timings do not clash. Visit to the Asiatic Library is only possible on weekdays & Saturdays. BHW cannot guarantee admission into sites/buildings if they are shut on public holidays or refuse permission for entry or are closed to the public for security reasons. It is recommended for all participants to carry their passports/ID cards while on the walk. Photography may not be permitted at all places; please check with your presenter while on the walk.